The Imo House of Assembly committee on Agriculture has called on autonomous communities in the state to come and account for the N300,000 they were given by the state government, sometime ago, for the planting of palm trees, popularly referred to as “Ikuo na Nkwu”. According to the release, signed by the House committee Chairman on Agriculture, Hon. Uche Agabiga, representing Orsu LGA, and aired on Imo Broadcasting Corporation, (IBC) radio station since Wednesday 1st November, 2017 the Uche Agabiga led committee said they will visit the communities to inspect the palm plantations and see if what is on ground is commensurate with the money they were given by the government for the programme. When contacted for comments, on why the House has not probed or investigated the bailout fund and the paris club fund in spite of enormous pressure, controversy and public outcry. More so, when civil servants and retirees, whose accumulated arrears of salaries and pensions should be cleared with the funds are dying in their numbers as a result of hunger, neglect, deprivation and lack, arising from non-payment of their statutory entitlements. Hon. Agabiga said, investigating what the communities did with the money they received from the state government to plant palm trees falls within his oversight functions as Chairman of the House committee on Agriculture, while the House Committee on public accounts should be concerned about the issue of the alleged missing bailout funds. “If they don’t ask questions about that, it does not mean that I should not do my job. That some things are wrong does not mean that we should allow everything to go wrong. We all know the importance of palm trees in the scheme of things today. It is wrong for traditional rulers who were given that kind of money for such laudable programme to misappropriate it”. When also asked why the House has failed to investigate or ask incisive questions about the alleged missing bailout and paris funds which, aside being the cause of several litigations, has elicited reactions from the Independent Newspaper Publishers Association (INPA), NGOs, youth groups and other professional bodies, the House committee Chairman on Public Accounts and member representing Oru West State constituency, Hon Offordi Donatus Onuigwe said, for his committee to intervene and investigate the matter, in the interest of Imolites, there must be a formal petition to the House. When also, reminded that the Agabiga led committee on Agriculture, did not request for or receive a formal petition before embarking on it’s own investigation of the N300,000 Agriculture loan to the communities, which if put together, is peanut, compared to the funds the House has ignored to investigate, the public accounts committee Chairman said, “I don’t really know how they are working or what prompted them to embark on their investigation. But for us, there must be a petition before we intervene”. 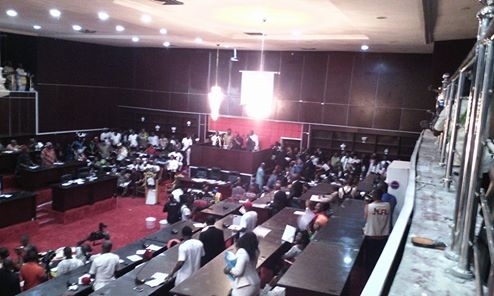 However, most people who commented on the issue on condition of anonymity, expressed dismay that the legislators have not deemed it fit to investigate how the bailout fund, paris club fund, and the various funds that have accrued to the state government were disbursed, in spite of pressures and calls from various quarters, for the government to render account to the people, on whose mandate they received the money. According to them, “It sounds funny and sends a very dangerous signal that the legislators have gone on air to call on traditional rulers to account for mere N300,000 they were given to plant palm trees, yet they have said and done nothing about the several billions of naira the state government has refused to account for, even, when, aside other overwhelming evidences, the Independent Corrupt Practices Commission (ICPC) has in it’s report, indicted the Okorocha led government of misappropriation. The government, also publicly accepted diverting the funds to other uses, they were not meant for”. A source in the House of Assembly, opined that the recent move by the legislators to investigate the disbursement of the N300,000 Agricultural loan, is a ploy to extort money from the communities, to fund their 2019 elections. “The present lawmakers in the state have become mere rubber stamps in the hands of the executive and now lack the capacity to perform effectively, in accordance with their oaths of office”.